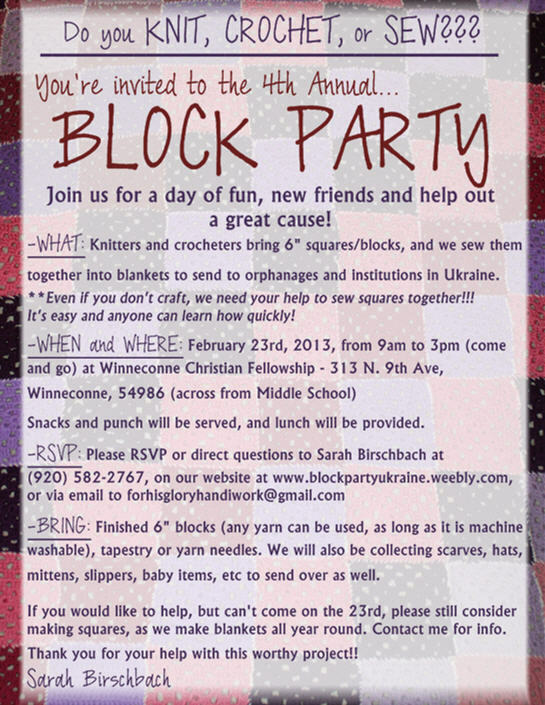 For His Glory Handiwork: Block Party Update! Yup. So I failed at keeping this blog updated about the Block Party. Contrary to previously announced date, the Block Party HAS NOT happened yet. It's being held a week from tomorrow, on February 23rd (we moved it from the 2nd mainly due to me traveling). And please go visit our new website! - Block Party Let me know what you think! Please don't forget to RSVP if you are coming, and thank you so much for your support with this project!! !